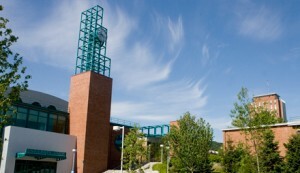 Binghamton University will now offers companies that collaborate on R&D projects an express license agreement. The Binghamton Express Square Terms (BEST) Deal License is a non-exclusive, royalty-free, paid-up license on patentable inventions that arise from sponsored research. About 18 percent of Binghamton University’s research awards, which totaled $34.9 million in 2010-11, come from business and industry. Industrial support accounted for just 6 percent of academic R&D funding nationwide, according to a 2010 report from the National Science Foundation. If a third party is interested in a license, that company will be charged no less than what the sponsor was charged plus an additional $1,000. This construct, Krentsel said, provides the original research sponsor with a competitive advantage and demonstrates the University’s appreciation of their initial investment in the work. The express license also reduces transaction costs for both sides. The BEST Deal is available to sponsors on an as-is basis. If a sponsor requests non-standard terms (for example, exclusive commercialization rights to a Binghamton or joint invention), then the parties will engage in traditional, good-faith discussions to set commercially reasonable terms.